A new reply from an old address… More information out there! I got a new reply to that letter I sent several weeks ago. Apparently ‘Roger’, the person who wrote the first reply, is the angry and overprotective grandson of William Jameson. Mister Jameson knew my grandfather and, in some way, my great grandfather. It seems the very name ‘Martens’ causes something of a stir around the Jameson Thanksgiving table. I’m not even sure if that’s a good or bad thing any more, and I can’t say I’m surprised. He didn’t say anything specific in the letter, but he definitely knows I’m not looking for any genealogical information, and he’s willing to give me more information. There are some weird conditions, like I have to hand-write him back, I’m not sure what that’s about, and he put this weird stuff at the bottom – I can barely make it out, but it doesn’t seem to be in English, or any other language I’m familiar with. This may be my best lead I’ve gotten since I started hunting through the trunk – I don’t know how far it will get me, but I hope it will finally get me some real answers. 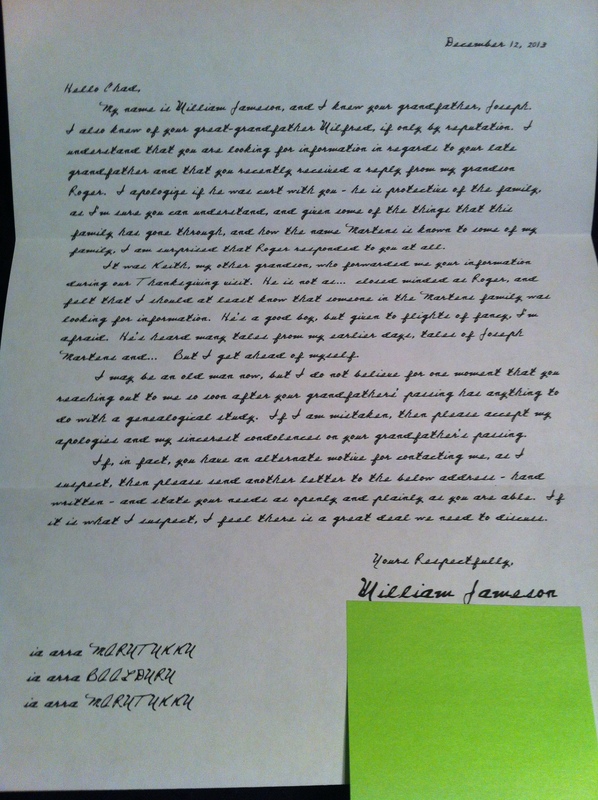 The letter is below – the green sticky note is over his address for privacy.